One popular modern scholar has gone to some lengths to insist that the Church established by Jesus figuratively walked off and hid behind a tree in the wilderness for many centuries and was really hanging around all along to come back with Joseph Smith’s assistance. Also that the LDS Church’s only real purpose, that separates it from others, is to act as the custodian/guardian of the temple ordinances. To any who have been beguiled by such falsehoods, I recommend reading a few works by a much more dependable and knowledgeable scholar: The World and the Prophets, Apostles and Bishops in Early Christianity, and When the Lights Went Out: Three Studies on the Ancient Apostasy; such should help, along with the below, to correct such misleading interpretations and errant notions. I, for one, hope that when scholars pit their academic learning against the revelations and teachings of modern prophets and apostles, we can be wise enough to choose correctly which to believe and where to place our faith and trust. If not, it is time to call all of the missionaries home; time to encourage people to attend other Churches; to cast our eyes and ears upon Popes and televangelists; to accept the baptism of any Christian religion; to shut the mouths of apostles who bear witness of Jesus the Christ, His restored gospel, the divine calling of Joseph Smith, and so on. Perhaps Joseph should have told Peter, James, and John, and John the Baptist that the authority they were restoring was not really necessary. Perhaps when Moses and Elijah and others showed up in the Kirtland Temple to bestow their keys, Joseph and Oliver should have told them it was unnecessary; they could go back to heaven. Joseph could get whatever doctrine he needed from the Catholics and Protestants. Read your books. There is a startling parallel between the course that is coming in to us today and the course that was in the early Church, so startling that one becomes fearful. We have these little groups going off on their own doing their own interpreting of the scriptures, more or less laying down their own principles. They are small now, of no particular consequence, but that is the way it began in the early Christian Church, and these little snowballs grew and grew and grew until they became great. "Scholasticism" took its root among those early peoples. There were a number of "schoolmen," they were called who undertook to define the doctrines of the early Church, then developing into the great Catholic Church—Bede, Alcuin, Damiani, Scotus, and others, Thomas Aquinas—they began the development, these individuals, of great heresies that took hold of the imaginations of the people and finally were adopted by the Church. Other councils followed, and from their decisions and the writings of churchmen and philosophers there came a synthesis of Greek philosophy and Christian doctrine in which the orthodox Christians of that day lost the fulness of truth about the nature of God and the Godhead. The consequences persist in the various creeds of Christianity, which declare a Godhead of only one being and which describe that single being or God as “incomprehensible” and “without body, parts, or passions.” One of the distinguishing features of the doctrine of The Church of Jesus Christ of Latter-day Saints is its rejection of all of these postbiblical creeds (see Stephen E. Robinson, Are Mormons Christians? [Salt Lake City: Bookcraft, 1991]; Encyclopedia of Mormonism, ed. Daniel H. Ludlow, 5 vols. [New York: Macmillan Publishing Co., 1992], 1:56-58, 1:393-404, 2:548-53). In the process of what we call the Apostasy, the tangible, personal God described in the Old and New Testaments was replaced by the abstract, incomprehensible deity defined by compromise with the speculative principles of Greek philosophy. The received language of the Bible remained, but the so-called hidden meanings of scriptural words were now explained in the vocabulary of a philosophy alien to their origins. In the language of that philosophy, God the Father ceased to be a Father in any but an allegorical sense. He ceased to exist as a comprehensible and compassionate being. And the separate identity of his Only Begotten Son was swallowed up in a philosophical abstraction that attempted to define a common substance and an incomprehensible relationship. 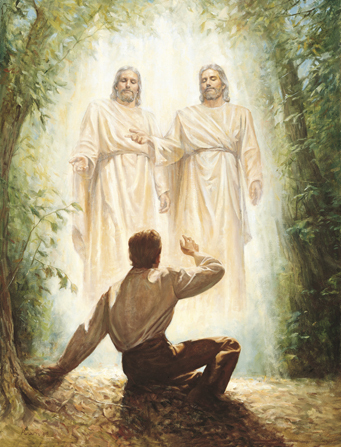 If we have said a great deal about the falling away and the loss of the true gospel to mankind in ancient times, let us make it clear here and now that such a teaching is not a part of the gospel at all; it is not found in the Articles of Faith; it has no bearing at all upon the plan of life and salvation; Joseph Smith almost never referred to it. We only mention the great apostasy because it is an historical point on which we are constantly being challenged: "How can you say," we are asked every day, "that the gospel of Jesus Christ has been restored to the earth if the Christian church has never ceased to be here?" There is no salvation outside The Church of Jesus Christ of Latter-day Saints. Salvation is available in and through this great latter-day kingdom and it only. “whosoever belongeth to my church [and as we have seen ‘my church’ by express, revealed definition is The Church of Jesus Christ of Latter-day Saints] need not fear, for such shall inherit the kingdom of heaven. . . . Behold, this is my doctrine—whosoever repenteth and cometh unto me, the same is my church. Whosoever declareth more or less than this, the same is not of me, but is against me; therefore he is not of my church. And now, behold, whosoever is of my church, and endureth of my church to the end, him will I establish upon my rock, and the gates of hell shall not prevail against them.” (D&C 10:55, 67-69.). . .